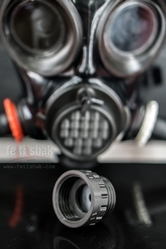 Unique Fetishak fitting for iconic british S10 gas mask, which allows you to capture breath-out for more advanced playing with this gas mask. Fitting is easy to setup to gasmaks, gas mask is not destroyed and can be restored to original system anytime. At first, disassembly drinking system tube by moderate pull on tube. Attach provided rubber O-ring on gorge around breath-out valve on S10 gas mask (instead of original drinking tube). And finally clip AirTube fitting on mask and enjoy! Colours and thread style of fitting are optionable. Rubber O-ring is part of order. Basic thread for most of common gas masks and accesories is based on NATO40 standard thread. 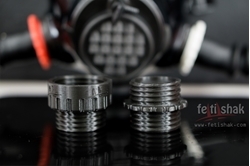 We designed special thread compatible with "west" (NATO gasmask system, like polupar british S10 gas mask) and "east" (e.g. soviet GP-5 gas masks). Copyright © 2019 Fetishak. Tous droits réservés.